I ask you, dear interwebs, can you get any more cheerful than this? 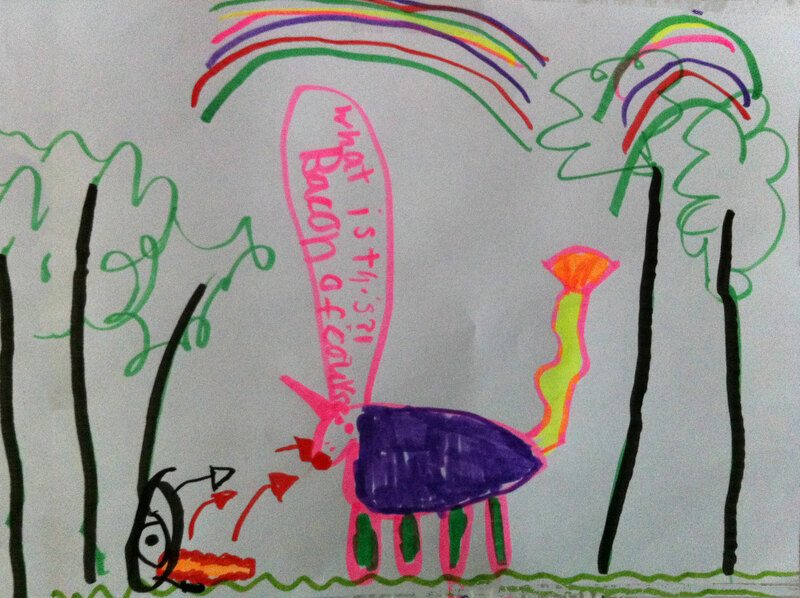 That is a unicorn, in an enchanted forest, under a double rainbow, with giant bacon coming out of a black hole ready to eat. Her other drawings included a pea growing in a garden that’s shouting “For the last time, I didn’t pee!”, a scientist/witch who is doing an experiment, a chicken nugget who thinks it’s a chicken, and a paper airplane that declares her love for me. This is the cheeriest of cheer. I love it. Also, the pea who is shouting that he didn’t pee? Hilarious. Her mind is amazing, and she has caused me giggles many times. You are so blessed with such entertaining children!